Turia or ridge gourd is a healthy vegetable, loaded with fibers. I like using this vegetable as you can combine it with so many other vegetables to make a nice shaak or sabji to go with chappatis, parathas, plain rice and even khichdi. When you buy turias remember to buy the sturdy and fresh ones. Dry turias do not cook well. Initally, the chopped turias may seem a lot in quantity but remember it contains a lot of water. While cooking, it will let out the water and the quantity will be reduced. Cook turias on its own or with vegetables like potatoes, beans, peas, spinach, fresh fenugreek or sweet corn etc. let your imagination run wild. 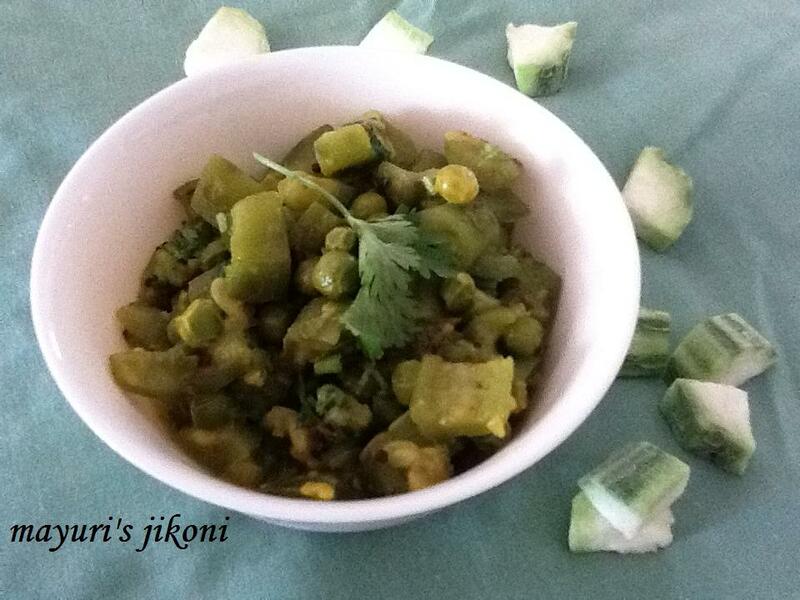 I made turia with fresh peas and its one of the simplest vegetables or shaak to prepare. Slice off the ends of the turia. Taste the flesh to make sure that the turias are not bitter. Peel the turias using a peeler. I like to leave the peel in some parts of the turia to give body to the vegetable. Wash the turias before chopping. Cut them into chunks. When the oil is hot, add methi, mustard seeds and cumin seeds. When the seeds begin to sizzle, add garlic. Stir fry the garlic till it becomes pink. Add chilli and ginger paste. Stir fry for a few seconds. Add hing and turmeric powder. Mix and immediately add the turia chunks and peas. Add salt and mix the vegetable well. Cover the pan and lower the heat. Cook till the turias are done. After 5 minutes check on the vegetable. If there is not much water, then you may need to add some for the turias to get cooked. Don’t add all of the ¼ cup. Just add a bit. You can add the remaining if required later. When the turias and peas are cooked add the coriander cumin powder and fresh coriander. Mix well. Serve the vegetable with parathas, chappatis or rice. Always buy an extra turia just in case one turns out bitter. You can use any proportion of the vegetables you like. The above recipe is just a guideline. If you don’t like the crunchy taste of the peel, then peel the turia completely. Can add a ¼ cup of tomato puree if you like. Thanks Beena. I love turias.